Tuna, avocado and spicy mayonnaise. 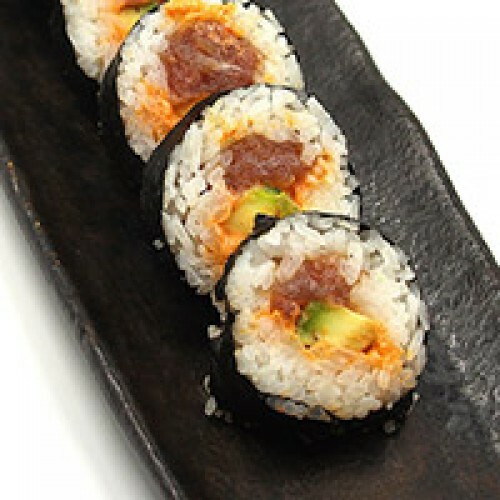 Dynamite roll (6pcs) - Deep-fried spicy tuna, asparagus and spring onion with teriyaki sauce, spicy ..
Salmon, avocado and spicy mayonnaise. ..
Prawn, avocado and spicy mayonnaise. ..
Sushi Set 5 (85 pcs) 5 Salmon, 5 Tuna, 5 Seabass, 5 Prawn, 5 Mackerel nigiri, 5 California roll, ..